By Srinivas Chowdary Sunkara // petrobazaar // 14th January, 2019. Fuel oil prices are ripped higher during the recent weeks. 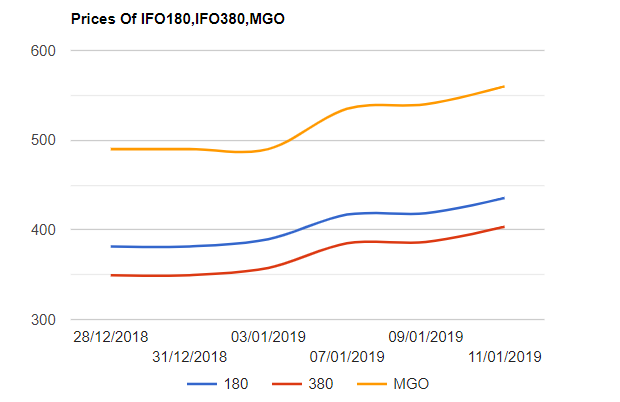 Both the Fuel oil 180 cSt and 380 cSt graded prices are spiked by $54 or 13.5 pct where as MGO prices are surged by $70 since January end. It all comes down to the simple laws of supply and demand and by a unique combination of different factors. Firstly, The predicted reduction of fuel oil production from existing refineries actually became reality. Secondly, A combination of OPEC cutbacks and Iranian sanctions saw an increased need for fuel oil in certain parts of the world. Turning to Indian market, Fuel oil prices are very likely to go up for the second fort night of January, 2019 since the average price of Fuel oil into Indian market was pushed up.